No, not those Bangles, I mean the type you wear! 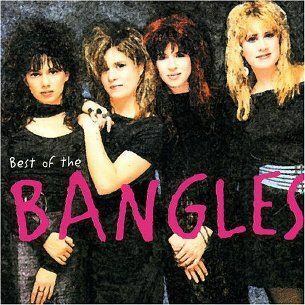 Im talking big fat, chunky, noisy clangin' around bangles. The ones that make it nearly impossible to type or even write without being loud. Its getting into spring and bracelets are a cool accessory.﻿ I dont wear too much jewelry, but i do like me some bracelets! 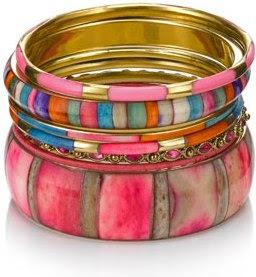 I came across a picture online and i thought these bangles were adorable! Now, I keep saying how much i am not a pink person, but i think these are really cute for something that is just oooooooooozzing pink. I love the difference in patterns, shades, texture..its a bit unorganized and "thrown together" But sometimes a mis mash works great like this one. I love it! I really want to buy some Indian Bangles though, i was looking at some online and they are cute, but when you have tons of jewelry (especially big clanging ones, you run into the question of storage space. I have a jewelry box, but its not made for costume jewelry, nor is it equipped to hold a lot of stuff. Ive seen youtube videos on making jewelry holders so I thin im goin to have to check them out and get some ideas.